FAKT EXHIBITIONS (Pvt.) 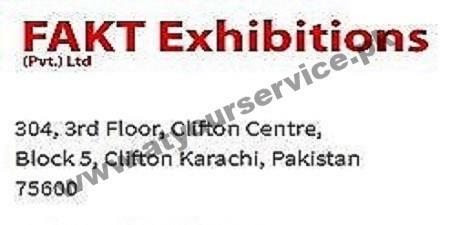 Ltd. is a leading exhibitions, conferences and event organizing company in Pakistan. We specialize in industrial, corporate and consumer exhibitions. Our primary focus is on organizing exhibitions that highlight the potential ‘trade’ possesses in terms of enriching Pakistan’s economy. Our trade shows, exhibitions, and conferences enable international and local decision makers to gain valuable market insight, network with prospective clients, launch or promote new products and most importantly provide innovators a platform to shine.